About a year ago my friend was on the Long Island Railroad sitting behind a group of five young religious women who were talking and she heard one of them complain that she doesn’t have anyone that she feels comfortable asking her niddah questions to. Others expressed their agreement, and one woman expressed frustration that the community doesn’t have a yoetzet halacha. Another woman chimed in: “Maybe I should study and become one?” At this point my friend, though somewhat embarrassed to admit to eavesdropping on their conversation, said: “Excuse me but the Five Towns does have a yoetzet!” The women were happily surprised to hear about it and my friend gave them my contact information. As mentioned in last weeks parsha, Parshat Pinchas, about 3,500 years ago, five other women, the daughters of a man named Tzelafchad, were frustrated and wondering what would become of their father’s name if they did not have a portion in the Land of Israel. They decided to ask a question. They were brave, they were righteous, and in their merit the Torah teaches us (at the end of this week’s parashah) a new halacha never taught before, about the ability of daughters to inherit property in the absence of a male heir. The Gemara in Sanhedrin 8a states that the law should’ve have been taught in the usual way, as a command from the Almighty to Moshe, but in the merit of the daughters of Tzelafchad, who wanted a portion of the land and went out of their way to ask Moshe, the law was taught through their question. It’s been five years since I was certified by Nishmat as a yoetzet halacha and took on the role as the Five Towns Yoetzet. They have been extremely rewarding years in which I have merited to meet incredible women, hear inspiring stories and struggles, and have learned and taught much. The Mishnah in Avot (2:5) states, “The shy cannot learn, and the impatient cannot teach.” Questioning is fundamental to Jewish learning. The first commandment of teaching in the Torah involves the four ways that a parent is to respond to the questions of his or her different child. The Gemara is structured by shakla v’tarya, question and answer, because we understand that Torah stays alive and dynamic through questions and engagement. Questions allow Torah to expand, and questions account for thousands of books of responsa written since the Middle Ages. But when it comes to the laws of niddah, laws of family purity, questions are both more necessary and more complicated than in other areas of Jewish law. Questions are more necessary because of the minimal education that women receive in this area until right before getting married, when they are taught these essential laws in the couple of months before their weddings. Questions in this area are also more complicated. 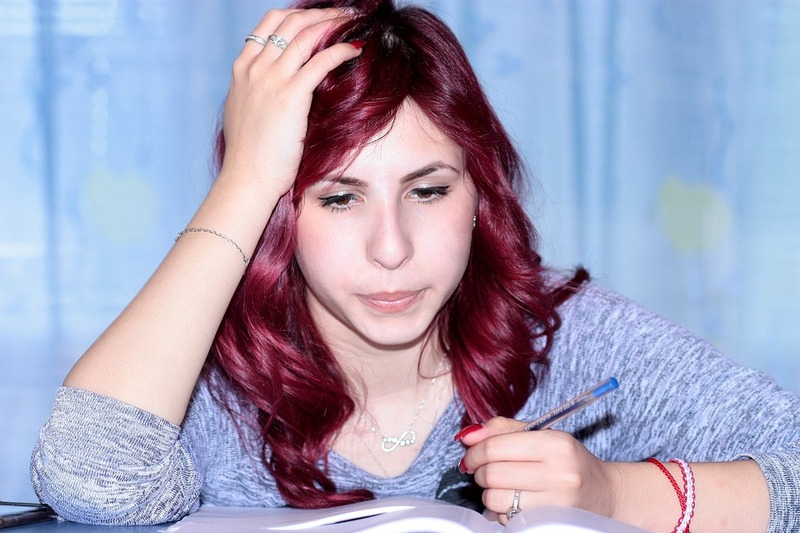 One thing that makes them more complicated is the general challenge of overcoming the natural embarrassment that impedes learning (as per the Mishnah in Avot—“the shy cannot learn”) which is multiplied exponentially when it comes to this area. After all, part of the Jewish laws and value system of tzniyut, modesty, require a certain kind of healthy shyness when it comes to issues relating to a woman’s body. When it comes to the laws of niddah, women want to preserve a certain sense of privacy and intimacy… and yet to learn and to observe the laws correctly they must find a way to ask and explore. Too often women call me only after months of being in niddah with no end in sight. Too often it is only after real suffering that they seek out help and ask. Over the years the phone calls I receive have grown from just over 300 the first year to close to 800 this year. The questions range from simple and straightforward matters of fact to complicated and unique situations, but in the vast majority of cases, what is being discussed is something about the woman’s body or intimate life. The woman asking the question is vulnerable. Only when the vulnerable individual asking can move beyond her discomfort, when there is comfort and ease with the one she is asking, can she learn. For many women that person can be the right man, a skilled, learned, and sensitive rabbi. For many. But by far not for all. I believe strongly that the more we create new opportunities for women to feel comfortable asking niddah questions, the more questions will be asked to both rabbis and yoatzot, the more Torah will be spread, and the more precisely and meaningfully will this foundational area of halacha be fulfilled. That is why the story I began with and other similar stories trouble me. Many women are unaware of the existence of a yoetzet halacha as resource. Some are not sure what a yoetzet halacha is. A yoetzet is a woman who starts with a very strong foundation in Torah study, and then devotes two years (over 1,000 hours) to intensive study with rabbinic authorities in taharat ha-mishpachah, Jewish family ritual law, in addition to receiving training from experts in modern medicine and psychology, including gynecology, infertility, women’s health, family dynamics, and sexuality. She serves a community by giving classes and answering phone calls, texts, and e-mails about issues relating to Jewish family ritual law. It is important for the broader religious community to be aware of this resource. 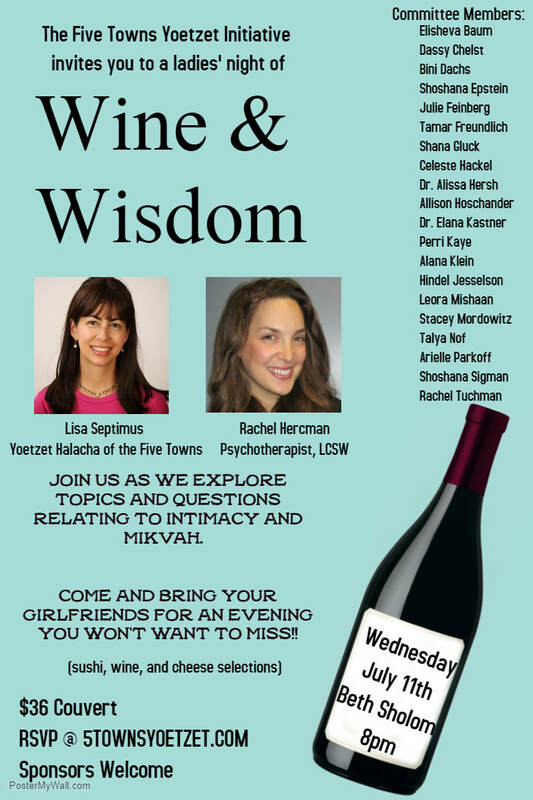 That is one reason that my community, the Five Towns, put together the Five Towns Yoetzet Initiative and is planning an enjoyable night for women to explore some matters that are private in an appropriate context with myself and therapist Rachel Hercman for this coming Wednesday. Whether this is the first time you are hearing about a yoetzet or it is old news, please check out the website 5townsyoetzet.com/events. Because there is always more to learn. And there are always new ways of becoming comfortable to ask. Lisa Septimus is the Yoetzet Halacha of the Five Towns and Great Neck. She teaches Talmud and Women and Jewish Law at North Shore Hebrew Academy High School and is the Director of Special Programs. She plays an active role as Rebbetzin at the Young Israel of North Woodmere where she is involved with adult education and youth programming. 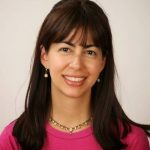 Lisa is a graduate of the first class of Nishmat’s Yoatzot Halacha Fellowship of the United States, GPATS, and she has a Masters in Bible from YU’s Bernard Revel Graduate School. She has lectured throughout the NY area. She is married to Rabbi Yehuda Septimus and is the mother of four young children.